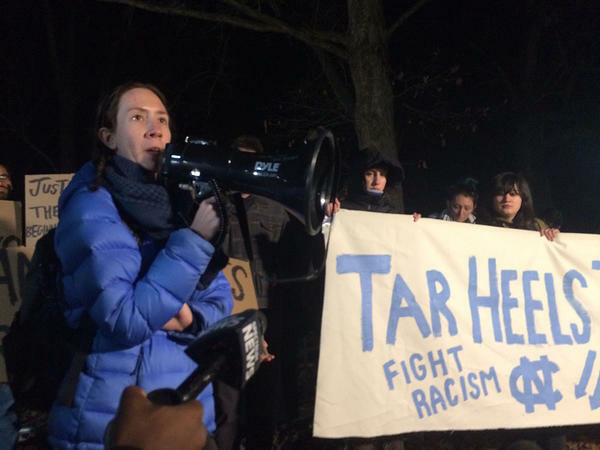 Graduate student Lindsay Ayling speaks to a couple dozens activists on Jan. 14, 2019 about outgoing Chancellor Carol Folt's decision to remove the Silent Sam pedestal from campus. File photo of UNC Chancellor Carol Folt, who announced her resignation at the end of the 2019 academic year. University of North Carolina-Chapel Hill Chancellor Carol Folt also announced that she will step down at the end of the school year. 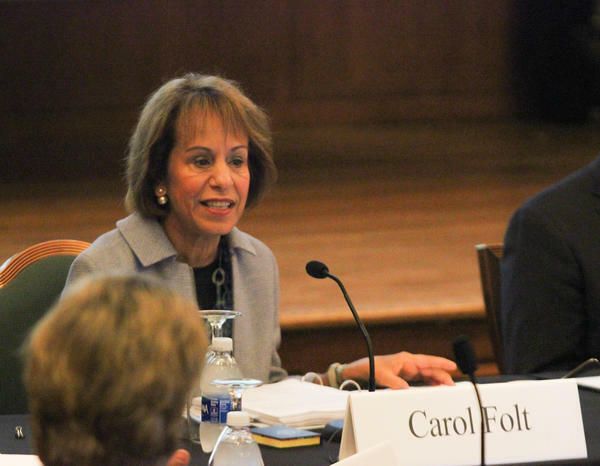 Folt's surprise order to put the pedestal in storage drew an angry response from the leader of the board overseeing the state's public universities, but he stopped short of saying he would seek to stop the removal. Folt announced her resignation in a campus-wide email and said it will take effect at the end of the academic year. She said she was concerned about safety at the site that continues to draw protesters for and against the statue known as "Silent Sam," but she gave no timetable for taking away the massive pedestal and bronze memorial plaques. The items would go into storage while their fate is decided. "The presence of the remaining parts of the monument on campus poses a continuing threat both to the personal safety and well-being of our community and to our ability to provide a stable, productive educational environment," Folt said in her letter to the Carolina community. "The fact that despite our best efforts even since then, threats have continued to grow and place our community at serious risk has led me to authorize this action." Last month, the board overseeing North Carolina's public universities rejected the UNC Trustees' plan for a center to house a Confederate statue on the Chapel Hill campus. Instead, the Board of Governors passed a resolution to have several of its members work with leaders at the Chapel Hill campus on a new plan. That revised plan is due March 15. Board of Governors Chairman Harry Smith said that Folt's announcement hadn't altered the statewide panel's timeline for deciding what to do with the statue. He said Folt's announcement surprised and disappointed the board. "We are incredibly disappointed at this intentional action," he said in a statement Monday night. "It lacks transparency and it undermines and insults the Board's goal to operate with class and dignity." "There has been too much recent disruption due to the monument controversy," Folt said in her letter. "Carolina’s leadership needs to return its full attention to helping our University achieve its vision and to live its values."